A delicious vegetarian sandwich with a difference. This light, yet filling Yogurt and Herb Summer sandwich is great for lunch, afternoon tea or a light supper. 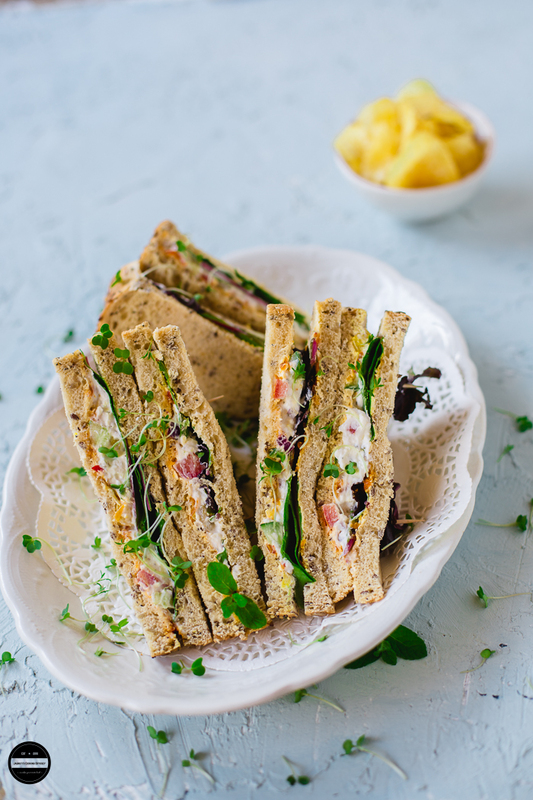 A sandwich prepared with multigrain and multiseed bread slices, a mild and luscious yoghurt spread made with colourful vegetables, fresh and aromatic herbs and lots of vibrant leafy salad. IPL in India has been getting hotter, just like their summer by the day and so does UK's weather. ( Right now temperatures are back to their teens) Well, we have accepted that UK's weather is always in terrible twos ;) and we have to live with it. Unseasonably the UK got so warm, the blistering sun was firing its rays. and making it the warmest April day in nearly 70 years. Suddenly the beast from the east seemed long gone and some of us just couldn't bear the sudden change in weather, Lol, I managed to get a bit of sunburnt while doing gardening. Let me be honest here although we Brits love to chase the sun, same time can't handle the scorching heat, like many, I too cannot handle anything more than 20C, I struggle and straight away that effects come in my cooking, That just made me think how on earth I used to cook in India in almost 40C..just mere of thought is making me dizzy! As the temperature was on the incline we just wanted to have something fresh and light for on that hot weekend. The Husband himself asked me not to cook anything elaborate and heavy, and asked me to make Yogurt sandwiches that I only prepare in warmer weather and try to avoid cheese as much as possible. We all agreed and next day our lunch was these Yogurt and Herb Summer Sandwich! Now that while we are talking about sandwiches, let me tell you one interesting fact about the sandwich, do you know why any kind of fat we apply on a bread before assembling the sandwiches? When you spread fat such as butter or mayo, these works as a barrier for the wetter ingredients such as tomatoes. Nowadays husband got into the habit asking me this, especially when he really like something ' Is this recipe already on your blog? ' This made me think that I have not posted a single recipe of sandwich on JCO! He said he'll wait until I take pictures, after a taking a couple of quick shots we relished these absolutely delicious, filling yet light meal that is so easy to whip up! These sandwiches are perfect for breakfast too if it's too warm to eat any cooked breakfasts where you are living. I have used multiseed and multigrain bread slices. Do not keep this sandwiches out for a long time, it may get soggy or yogurt turn sourer. Don't have time to drain the yougurt? pick up very thick yogurt such as greek. 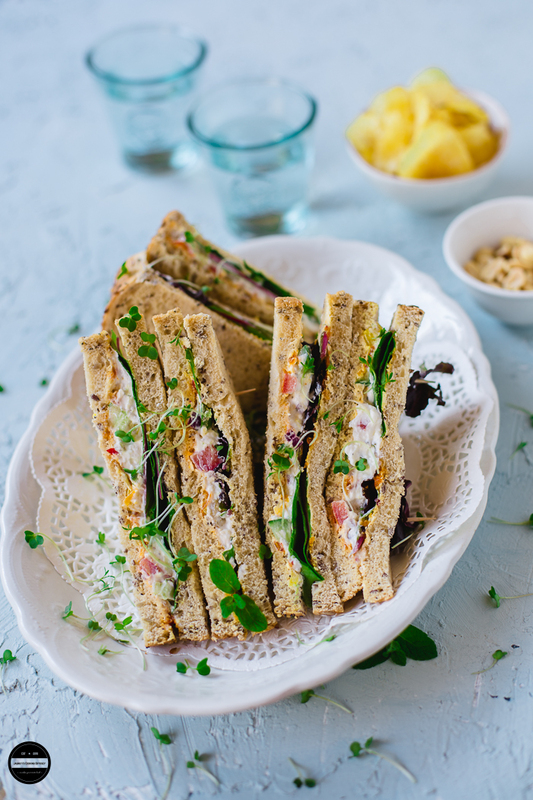 A delicious, healthy and light Yogurt and Herb Sandwich is a fuss-free and no-cook recipe. A few hours back or at night drain the water from the yogurt. Make sure yogurt is well drained. In a big bowl, place the yogurt and whisk it and make yogurt very smooth. Add all the vegetables, herb, dried mixed herbs, black pepper powder and salt. Now spread the bread slices with butter or margarine and chutney. On one slice thinly spread yogurt mixture, add some leafy salad and watercress. Then put another slice of bread over the assembled slice. Press it gently and cut it into the triangle shape. 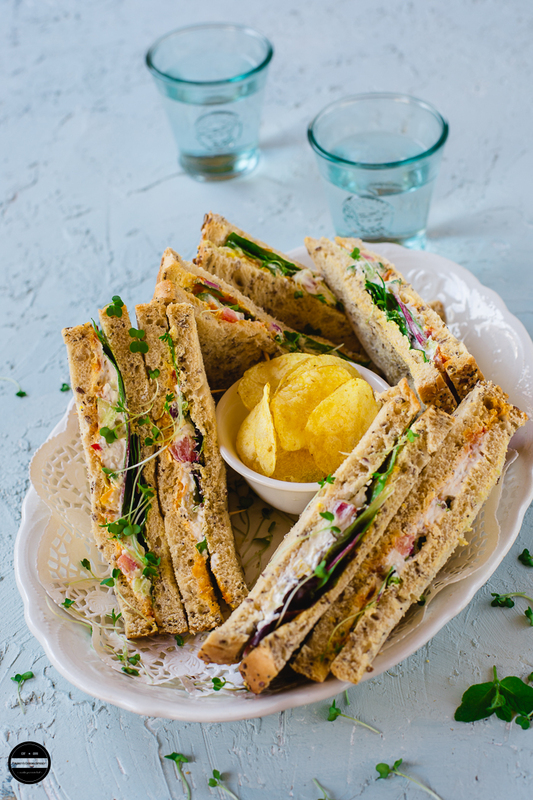 This is my kind of meal right now in this hot sultry weather, the sandwiches �� looks super tempting and some crunchy chips to go with it just bliss. Thanks Spice Affairs! yes, I have heard about scorching temperatures in India. Stay safe. Love these sandwiches Jagruti. Not only breakfast love to have these in lunch or dinner. These looks super tempting. Perfect and light lunch in summers.. I just love these sandwiches. I have become a big fan of hung curd and use it liberally to make spreads. This sandwich must be so delicious and light on the stomach in summer. Sandwiches looks awesome and healthy filling. Perfect snacks for picnics and small gathering. I often replace the mayo in sandwiches with thick yoghurt. It is a great replacement and very refreshing. I hope the heat wave stays so you can enjoy these tasty sandwiches again. If i get those alluring sandwiches, am ready to go for a picnic. And those sandwiches looks absolutely incredible and definitely refreshing as well. 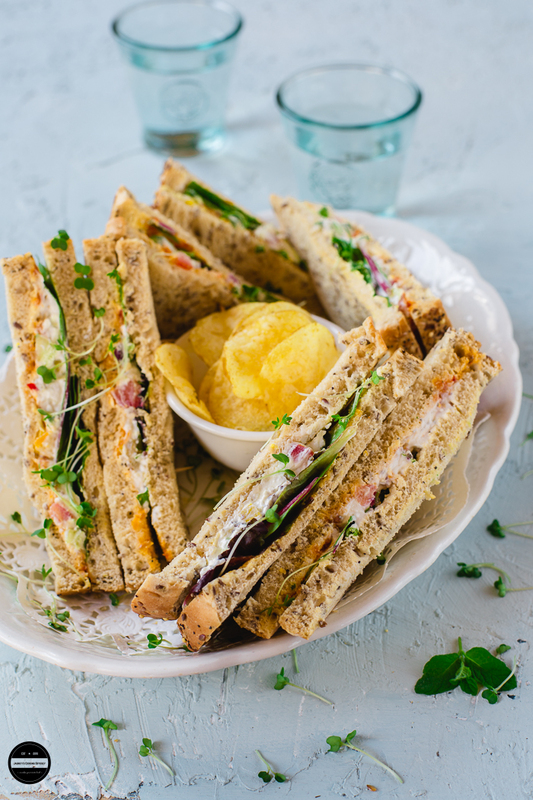 These refreshing sandwiches are a healthy way to start the day and so light on the stomach especially during summers...Great share!! Yogurt and herb sandwich sounds so good. Now it’s perfect time to cool the heat with light and healthy and no cook sandwiches! That is a delicious set of yogurt sandwiches and am sure your husband loves them for he has asked for it. it is indeed a savior for the hot sweaty days. Thank you for the recipe, Jagruthi. This one is my kind of Sandwich, with lots of veggies. It looks super tempting dear!! I love yoghurt sandwiches and yours looks so good Jagruti. They are a quick fix anytime. Years back when we didn't get cream cheese or ricotta (again we don't get it!) I use make sandwiches with yogurt spread for hubby. He would only take sandwiches to work and had to innovate. Hung yogurt with finely chopped cucumber, mint and coriander. Love your recipe with so much more greens, herbs and veggies. A perfect summer treat. Just yesterday my brother too was complaining about the scorching heat. These Sandwiches are perfect filling meal during summers. Sounds healthy and refreshing. Loved the use of herbs and veggies.